Survival doesn’t often allow you to pick your time or your location. Choosing when and where you must survive is not a luxury typically afforded to most survivors. Despite our preparations, we may be thrust into survival situations where our supplies and even our health is less than ideal. It’s at times such as these where knowledge, ingenuity, and determinations reign supreme. With these attributes, you can adapt and overcome most any situation. That’s another reason to learn skills such as fire building, snare making, and knot tying. As mentioned in prior posts, cordage is a great friend to anyone trying to make it in the wilderness. It can be used in countless ways. From setting a snare to catch small game to making a shelter to get you out of the elements, cordage is good. Unfortunately, we don’t always have the best cordage for our situation. We may have to make use of cordage that is not well suited for our purpose. For example, the cordage may be little more than slippery pieces of wet leather strips or extremely slippery nylon rope. It’s important to be able to tie a knot that won’t slip when stressed. You don’t want your improvised hammock to come crashing down in the in middle of the night! That’s where the Vice Versa knot can help. It’s a great knot for slippery, wet cordage. Step 1. Lay to two ropes with the standing ends stretching out in opposition directions. Step 2. Take the rope farther from you and tie a half hitch around the closer rope. Bring the rope under the closer rope, around and back over the closer rope, and finally under itself as shown. Under, over, under. Step 3. Similarly using the closer of the two ropes, loop the rope around the farther of the two ropes. This time go over the second rope, around behind it and then over the first rope as shown in the picture. It’s important that each of the crossing points are done correctly. Step 4. Both working ends should near each other at this point. Place the second one behind the first. Step 5. 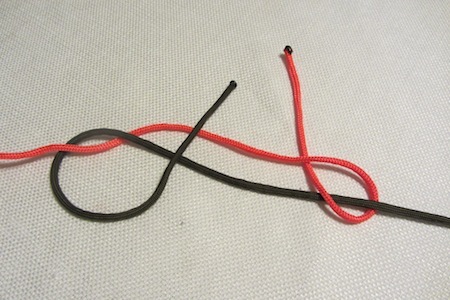 Finally, bring each end through the loop create during steps 2 and 3 from the underneath side. Step 6. Cinch the knot. This looks very complicated, but it’s not. This video helps to further demonstrate it. Thanks, Mike! You’re right, I haven’t shared the clove hitch yet. Great knot that’s easy to tie and very stable as long as you have a load on it. Awesome demonstration, photos, and so useful. This knot absolutely does not slip. It is used by mariners and commercial fishermen in Alaska throughout Alaska. A good article might be to remind everyone that one of the first things to go will be the cellphone towers. And the very next thing will be the Internet (to include Google, Wiki, youtube). No more maps. No more answers. No more email to friends and family nor phone calls. No Skype. No MSN. No videochat, no texts, no status. The public libraries if open probably won’t have the things we’d be interested in. I’d also guess that the publically-available (non-military) GPS will no longer be working. Old-school maps. If radio stations still work then they’ll likely be used by the NWO to spread disinformation and will be of little use. And yet people may still have and protect their radios. Laura touched on this briefly a while back in a post about making a prepper notebook. https://preppingtosurvive.com/2011/07/15/the-prepper’s-notebook/ But I’m sure it could/should be updated. I’m curious though, when you say “A good article might be to remind everyone that one of the first things to go will be the cellphone towers. And the very next thing will be the Internet…” What kind of TEOTWAWKI event are you envisioning? EMP? Economic collapse? Something else?